and other visions and dreams that contain the same symbols. 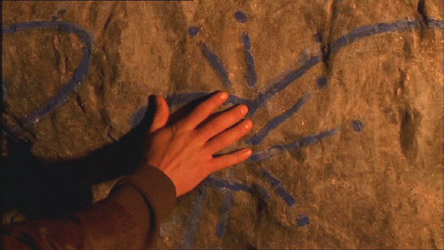 The symbols on the cave wall are first seen in the episode 'River Dog'. RD was instructed to show it only to those who passed a test. He showed it to Max after he passed the test of using his alien powers to create a light. RD says that the visitor drew the cave painting, but he never told RD what it meant. Max asks if anyone else has come to see it, but RD tells him no. 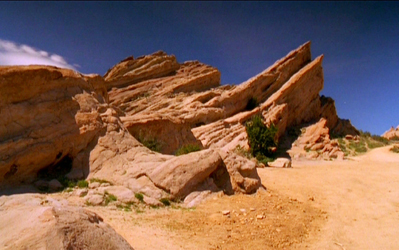 In the episode 'The Balance', Michael sees the painting for the first time and realizes it is a map, and the healing stones fit into it, making the 'V'-formation. 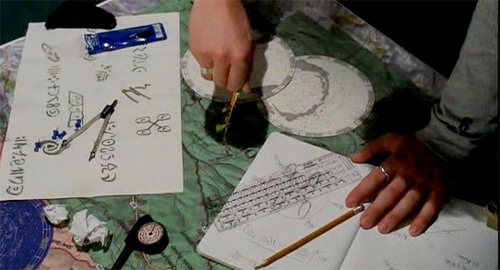 In 'Blind Date', Michael figures out that one of the symbols on the map leads to the Roswell Library. Here is how in his own words. This is the constellation I saw in my dream. It's Aries, the ram. (he is refering to the 'V' constellation). I looked it up. And this is the symbol Nasedo left us at the cave. If you take a map of Roswell and you position it properly when Aries is directly overhead, which is in April by the way, all the rest of these symbols take on locations. 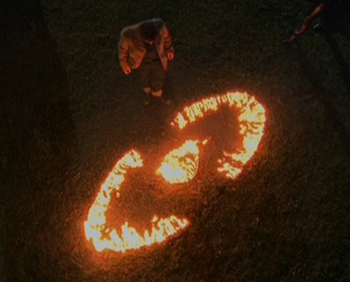 Michael and Isabel go to the library and burn an alien symbol into the grass as a message to Nasedo. Nasedo doesn't reveal himself to them, but Michael was correct about the location. 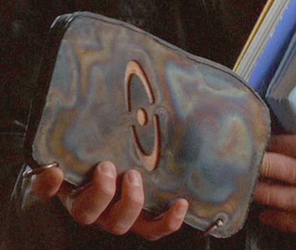 Later Tess takes the 'destiny book' out of the wall of the library, that has the symbol on the cover that is on the map. So the symbol on the map was clearly refering to the Destiny Book. We discovered some of the locations on the map, but not all, and we can guess at other locations. The unnumbered symbols are words in the alien language which can also be seen in the 'destiny book'. Most likely they are some kind of directions, titles or a legend. Atherton's house in Marathon, TX where the pendant necklace was found. The symbol was also seen on the granolith when it was taking off, so it could represent it. It is also the symbol on the communication orb, so it might be where that was buried, or the location or another orb that we don't know about. 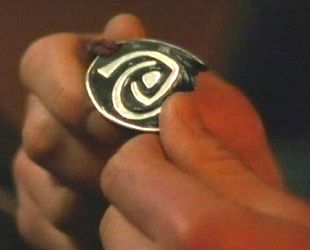 It is also the same symbol as the signal Nasedo sent the podsters in 'Into the Woods' that was near the cave, so it could represent the location of the cave. Or it might be another unknown location. 3. this symbol seems to be of a solar system, but which one or what it means is unknown. If it is supposed to represent our solar system then Saturn is in the wrong place. Hard to say, but unlikely the aliens would make a mistake like that. 4. 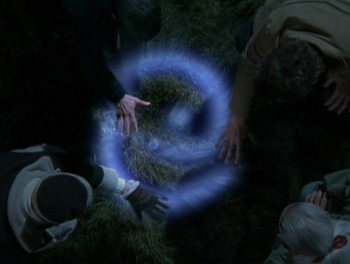 Michael says that this symbol is where Polhman ranch is - where the crash happened, and where we think the pod chamber is likely located - and it certainly looks like the pods in the pod chamber. 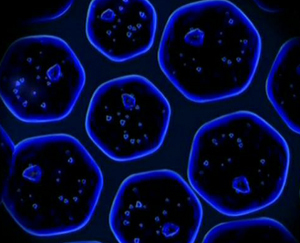 It is also similar to the structure of cells. Possibly it is the location of the Ganderium cave. 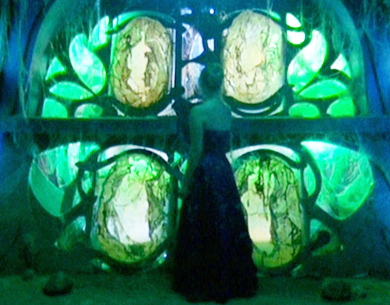 Some people have even speculated that it is the dupes' pods, showing that they are hanging on the wall in the sewer. Of course there are too many pods, if that is the case. And as you can see below, the same symbols also appeared in the dreams the podsters had, and the visions Michael had when he was in the 'balance' coma. Kinda weird, unless the dreams were 'programmed' into the podsters and Nasedo, or someone like Tess or Nasedo was sending them the dreams and visions. 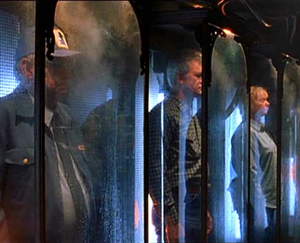 If they were programmed, then either the aliens knew about the locations on Earth before the pods were sent, or the Shapeshifters were able to program the dreams after they arrived on Earth. 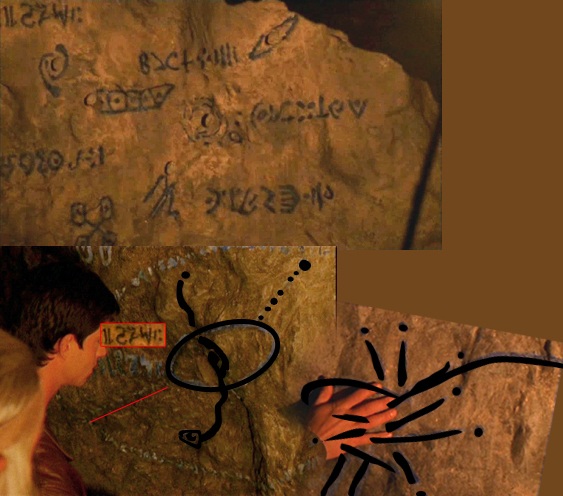 It might be of interest to some 'conspiracy theorists' that the symbols in the cave painting and the symobls in the visions are laid out a bit differently, as you can see from a comparison to Max's drawing from the cave. 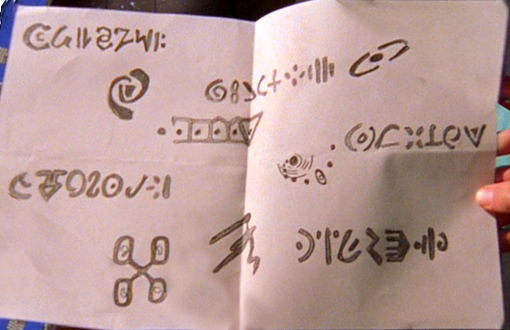 Note the placement of the rock formation in both, and the the location of the 'solar system' symbol, and one of the lines of 'alien language' is in a completely different place. 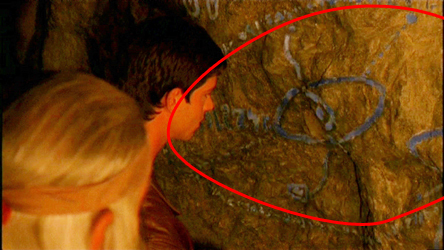 There are also two extra symbols, and possibly more, on the cave wall that Max didn't put in his drawings, and they don't appear in the visions or dreams. There is a type of 'starburst' and a oval-shaped symbol next to it that resembles an eye on the wall beneath the 4 Square symbol. 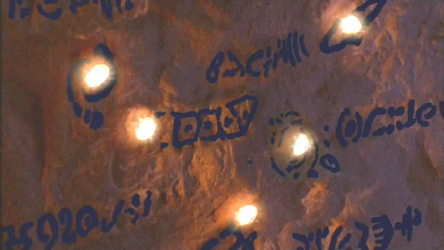 It is possible the symbols are other locations on the map, or possibly an additional message or legend. It is hard to see, but it appears the two symbols are surrounded in a larger oval shape with some other type of smaller symbols, possibly the alien language that is in the 'destiny book'. In the pic below, I marked the text so it is easier to see, it is on the outside of the red oval. Below is a composite image showing where the additional symbols are on the wall are in relation to the symbols we are familiar with. I outlined the shapes the best I could, but it is difficult to see the true shapes due to the low light of the orig pics, but I think it is pretty close. 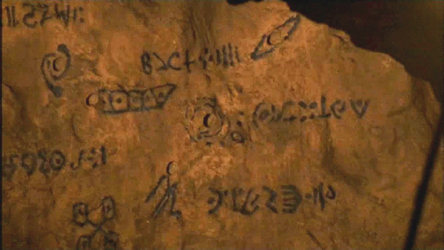 There is a line of characters in the alien language that seem to be the same as the line in the top left corner. I put a copy of the characters above and outlined them in red. There is also a possible other line of characters or symbols that are too hard to see what they are, but I underlined them in red.